You may have heard about Mike and Molly. It's a new sitcom about two morbidly obese overeaters who meet at an Overeaters Anonymous meeting and fall in love. It's directed by veteran sitcom guy James Burrows (Laverne and Shirley, Taxi, Cheers, Frasier, Friends, Will and Grace and many more) and I counted 23 explicitly fat jokes in the 20 minute series premiere. 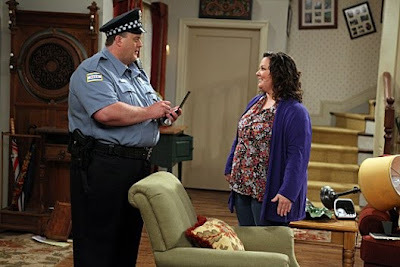 The sitcom itself, aside from the fat focus, is pretty formulaic and nothing to write home about. But what about the fat jokes? To be honest, I'm not sure what to think. On the one hand the jokes weren't cruel or intentionally launched to hurt the characters' feelings. They were more along the lines of the types of jokes that might be cracked about a person's strange taste in clothing. On the other hand, joking about obesity, a condition that for some causes dramatic personal, social and medical angst and suffering, seems callous regardless of intentions - I've never seen any sitcoms about cancer. I guess the question I'm left with is whether or not the normalization of making jokes at the expense of a person's weight is wise, and while the show's jokes are good natured, I suspect the general public's versions will often be of a different flavour and I worry that this show simply adds to society's unfounded belief that fat jokes are fair game.